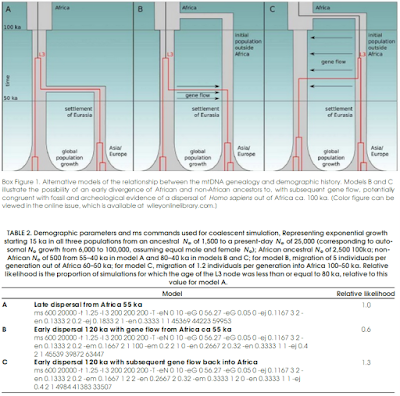 An excellent review which -among its other graces- demolishes the view that mtDNA haplogroup L3 provides a terminus post quem of 70 thousand years for the Out-of-Africa expansion, a question I've discussed in this blog before. I think the evidence is overwhelming at this point that there were modern humans outside Africa before 100,000 years ago. The argument that they were a failed expansion is shoddy and is based, as far as I can tell on things like the age of L3, the assumption that Y-chromosome haplogroup E is native to Africa and not derived from back-to-Africa migrants, the assumption that Out-of-Africa coincided with the Upper Paleolithic cultural efflorescence (disproven by the earlier dating of Neandertal admixture), or the failed hypothesis of a coastal route Out of Africa 60 thousand years ago that seems to be repeated in inverse proportion to the evidence for it. The halving of the human autosomal mutation rate relative to what was inferred before has certainly not helped either. Current fossil, genetic, and archeological data indicate that Homo sapiens originated in Africa in the late Middle Pleistocene. By the end of the Late Pleistocene, our species was distributed across every continent except Antarctica, setting the foundations for the subsequent demographic and cultural changes of the Holocene. The intervening processes remain intensely debated and a key theme in hominin evolutionary studies. 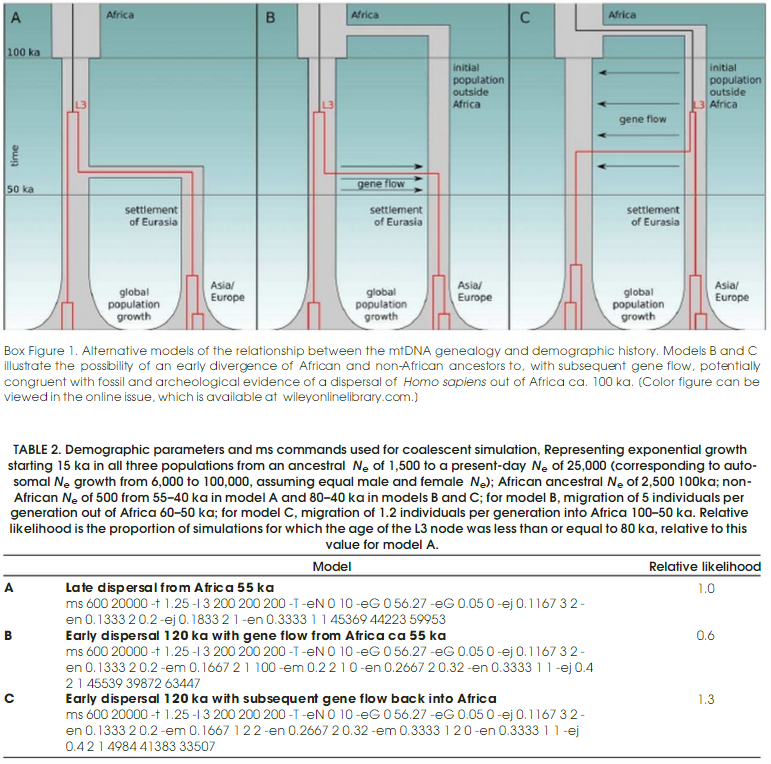 We review archeological, fossil, environmental, and genetic data to evaluate the current state of knowledge on the dispersal of Homo sapiens out of Africa. The emerging picture of the dispersal process suggests dynamic behavioral variability, complex interactions between populations, and an intricate genetic and cultural legacy. This evolutionary and historical complexity challenges simple narratives and suggests that hybrid models and the testing of explicit hypotheses are required to understand the expansion of Homo sapiens into Eurasia. The ancient geography of the Mediterranean Basin was profoundly changed by the increase in sea level following the Last Glacial Maximum. This global event has led to the retreat of the coastlines, especially in lowland areas and shallow shelves, such as the Sicilian Channel. The NW sector of this shelf, known as Adventure Plateau, is studded by isolated shoals mostly composed of Late Miocene carbonate rocks and by some volcanic edifices. These shoals, until at least the Early Holocene, formed an archipelago of several islands separated by stretches of extremely shallow sea. One of these submerged features – the Pantelleria Vecchia Bank – located 60 km south of Sicily, has been extensively surveyed using geophysical and geological methods. It is composed of two main shoals, connected seaward by a rectilinear ridge which encloses an embayment. Here we present morphological evidence, underwater observations, and results of petrographic analysis of a man-made, 12 m long monolith resting on the sea-floor of the embayment at a water depth of 40 m. It is broken into two parts, and has three regular holes: one at its end which passes through from part to part, the others in two of its sides. The monolith is composed of calcirudites of Late Pleistocene age, as determined from radiocarbon measurements conducted on several shell fragments extracted from the rock samples. The same age and composition characterize the metre-size blocks forming the rectilinear ridge. The rest of the rocks composing the shoals are mostly Tortonian limestones–sandstones, as revealed by their fossil content. Extrapolating ages from the local sea level curve, we infer that seawater inundated the inner lands at 9350 ± 200 year B.P., the upper limit which can be reasonably taken for the site abandonment. This discovery provides evidence for a significant Mesolithic human activity in the Sicilian Channel region. Πολύ σημαντικό πρόσφατο εύρημα αποτελεί η ανάκτηση ολόκληρων γονιδιωμάτων από τρεις προϊστορικούς αγρότες, που έζησαν στη Βόρεια Ελλάδα 7.500 με 5.500 χρόνια πριν από σήμερα. Τα δεδομένα αυτά αναλύονται και αναμένεται να ρίξουν φως στις προγονικές σχέσεις των πρώτων Ευρωπαίων και να δώσουν πλήθος πληροφοριών, που συνδέονται με λειτουργικά και μορφολογικά χαρακτηριστικά. Ήδη, είναι γνωστό, ότι κάποιοι νεολιθικοί πρόγονοί μας δε μπορούσαν να πέψουν το γάλα, ήταν δηλαδή δυσανεκτικοί στη λακτόζη και είχαν καστανά μάτια και σκουρόχρωμη επιδερμίδα.